After 4th October, there will have been thirty seven different referendum contests held in the history of the state, but some of these contests have taken place on the same date, while the same issue has been the focus of a referendum vote on more than one occasion in a number of instances. The most recent cases include the holding of two referendum votes on the Nice and Lisbon treaties, but the issues of Divorce and the Electoral System (proposals to change the Irish system to a first past the post one) have also been the focus of referendum contests on two, or more, occasions. In most of these cases, the failure of a referendum proposal relating to a certain issue has been followed by the passing of another, ultimately similar, proposal on that issue in a referendum vote – in some cases taking place little more than a year after the initial vote (the Nice Treaty and Lisbon Treaty referenda) but in other cases taking place roughly a decade later (the referenda on the introduction of Divorce and the proposal to change the electoral system). The 1968 referendum is the only case where the re-running of a referendum vote on an issue has resulted in the defeat of that proposal on a second occasion. Following next month’s votes on Seanad Abolition and the Court of Appeals, Referendum elections will have taken place on twenty seven different occasions/dates in the history of the Irish state, with a significant increase in the incidence of these in more recent decades with 63.0% of these (17) having taken place over the past two decades. Referendum elections took place on ten different occasions (including cases where a number of referendum votes took place on the same day) between the founding of the State and 1987, but – after next month’s elections – referendum contests have also taken place on on a further seventeen different occasions/dates in the 1990s and 2000s. Prior to the October 2013 contest, the proposed changes to the Constitution have been carried on twenty-six out of these thirty-five different occasions, with referendum proposals being defeated on nine different occasions. Ironically, given a recent incidence of referendum defeats (including the first Nice Treaty and Lisbon Treaty referendum contests and the Oireachtas inquiries proposal, in addition to the 2002 Abortion Referendum), referendum proposals were relatively less likely to be carried in the earlier decades of the state, with the government failing to carry the first three referendum contests (1958 and 1968 – two contests on the same day) after the passing of the vote on the new Constitution in 1937. The strongest level of support ever recorded for a referendum proposal was the 1,427,520 valid votes cast in support of the Citizenship Referendum in 2004 – although the size of this vote was to a large degree reflective of the fact that European and local elections were being held on the same day as that poll, pushing up the turnout level above that normally associated with referendum contests. The highest level of support in percentage terms for a referendum proposal was actually associated with referendum contest with the lowest (percentage) turnout level in the history of Irish referendum contests – the 1979 Adoption referendum vote – wherein the proposal was supported by 98.97% of the valid vote (but only by 27.61% of the registered electorate). The highest level of opposition to a referendum proposal – but in terms of actual votes and percentage support levels – was associated with the 1992 Right to Life referendum proposal, which was opposed by over one million voters (1,079,297) – the only time that this level has amounted to a seven-figure number – or, in percentage terms, by 65.35% of the valid voters. There have been a number of dates on which more than one referendum contest has taken place. In the earlier instances of this phenomenon, voting patterns tended to be very similar in the different contests being held on the same day. For instance, this can be clearly seen in the first two instances on which two referendum contests took place on the same date. The percentage level of support in 1968 for the proposal to replace the proportional referendum by single transferable vote with the first past the post electoral system was 39.16% (and the level of spoilt/invalid votes was 4.27%). On the same day, a proposal to change the stipulation on constituency proportionality to favour low density regions within the state was also rejected, with this proposal being supported by 39.24% of the valid votes and with a spoilt/invalid vote level of 4.29%. The percentage level of support in 1968 for the proposal to reduce the voting age from 21 to 18 was 84.64% (and the level of spoilt/invalid votes was 5.21%), while the recognition of religions proposal was supported by 84.64% of the valid votes and with a spoilt/invalid vote level of 5.46%. A similar correspondence between voting patterns across two referendum votes being held on the same day was also observed in the low turnout vote of 1979, with 98.97% supporting the Adoption referendum and 92.40% supporting the referendum on changing the rules as to the electorates for the Seanad university seats. 1992 marked the first occasion on which there were notably different results for the multiple referendum contests taking place on the same day, with the proposed Right to Life constitutional amendment being comfortably defeated (34.65% level of support) but with the results of the other referendum contests taking place on that day resulting in victories for the proposed amendments – with 62.39% supporting the proposed Right to Travel constitutional amendment and 59.88% supporting the Freedom of Information constitutional amendment. Similarly, there were mixed results for the two referendum contests held in October 2011 – the only other occasion prior to the October 4th 2013 vote on which two referendum issues have been put before the electorate on the same day – with the Judges Renumeration proposal being passed comfortably (79.74% in favour) but with the Oireachtas Inquiries proposal being defeated by a relatively narrow margin (46.66% in favour). Holding a number of referendum votes on the same day does not mean that turnouts will be higher; indeed some of the lowest turnout referendum days were ones that involved a number of contests being held on the same day (1979, 2001). 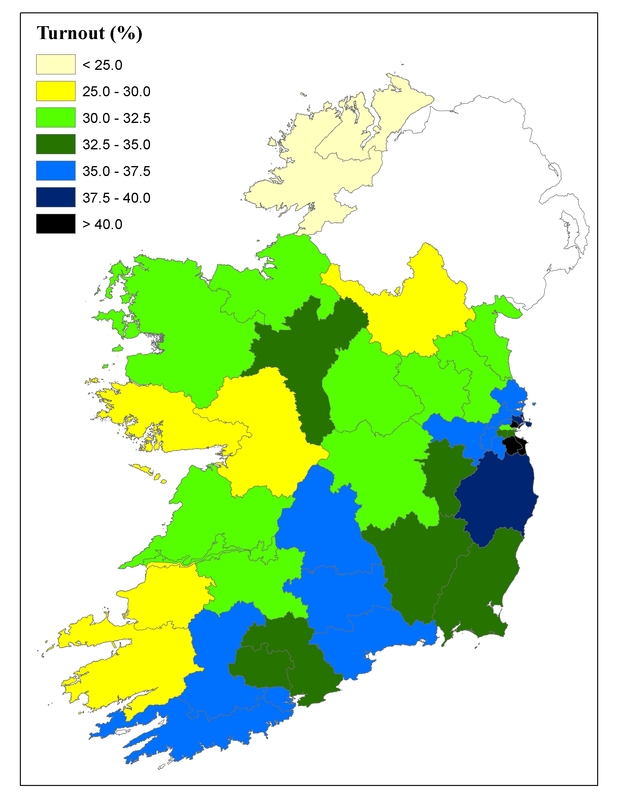 In keeping with the second order election model, which argues that turnout levels in second order election contests will tend to be lower than those in first order elections (general elections, in the Irish context), referendum turnouts usually tend to be somewhat lower than those recorded in general elections. The relatively high turnouts in the 1950s, 1960s and early 1970s pale in comparison with the average turnout levels in general election contests during that era, which would consistently have been in the high 70s. The difference in turnout levels between general election and referendum contests tends to be sharpest in rural and urban working class areas, but not as significant in urban middle class areas. As the graph below shows (Figure 1), voter turnout levels have varied quite significantly in Irish referendum election contests, ranging from a high level of 75.8% for the very first such referendum on the draft constitution in 1937 to a low of 28.6% for the 1979 referenda on adoption rights and university representation in the Seanad. The mean turnout level across these different referendum polling days is 51.76%. By default, the numbers turning out to vote in a referendum will always be somewhat lower than those for general and especially local election as a not insignificant number of people (all registered voters with exception of Irish citizens) on the register do not have the right to vote in referendum contests (although in more recent times these numbers have tended to be excluded from the valid poll figures for referendum contests, meaning that the percentage turnout level tends to be more accurate). Turnout levels vary depending on the time period involved, with higher turnouts having generally been recorded for the earliest referendum contests held, but also with a notable difference in turnout levels between the contests held in the low turnout era of the late 1990s and early 2000s against those held in the mid-to-late 2000s when turnout levels, on average, showed a somewhat marked degree of improvement. Turnout propensity in referendum elections may also be shaped based on whether other types of elections are being held on the same day as the referendum contest – the most notable example here being the high turnout for the second set of referendum elections held in 1992, which were held on the same day as the 1992 General Election. The fact that the 1999 and 2004 referendum contests were held on the same day as local and European elections probably was also a factor in terms of increasing turnout propensity for those contests, especially in the more rural areas where turnout levels for local elections will generally tend to be highest. A similar trend could also be inferred in terms of explaining the relatively high turnouts for the 2011 contests, which were held on the same day as the 2011 Presidential Election (and the Dublin West by-election). In numerical terms, the highest ever actual number of voters who turned out to vote in a referendum election was the 1,823,434 people who turned out to vote in the Citizenship Referendum in June 2004. This was held on the same day at the 2004 Local and European elections. The highest number of voters who turned out to vote in a referendum that was not held on the same day as another electoral contest was the 1,816,098 people who turned out to vote in the 2009 Lisbon Treaty (II) Referendum. Roughly one-in-forty of the votes cast in all referendum elections during the history of the state have been spoilt/deemed invalid, a rather surprisingly high level given that voting in these should ultimately prove to be relatively straight-forward and a less difficult prospect than voting in a general, local, European or presidential election. In all, over one million of the votes cast across all these different referendum contests (1,138,657) have been deemed to be invalid. Admittedly, however, the level of spoilt or invalid votes has fallen in more recent decades and little more than one in a hundred votes (1.09%) in referendum contests held during the 2000s were deemed to be invalid. The highest level of invalid votes in a referendum contest was actually associated with the first such contest, with just under ten percent of the votes cast (9.97%) on the vote on the new Constitution being deemed to be invalid (134,157 spoilt votes). In more recent times, the higher levels of spoilt or invalid votes have tended to be associated with referendum contests that are held on the same day as other electoral contests. For instance, 109,066 votes cast (7.65% of the total poll) in the 1999 Local Government Referendum, which was held on the same day as the 1999 European and local elections, were deemed to be invalid. Likewise, just under five percent of the votes cast in the three referenda that were held on the same day as the 1992 General Election were deemed to be invalid. 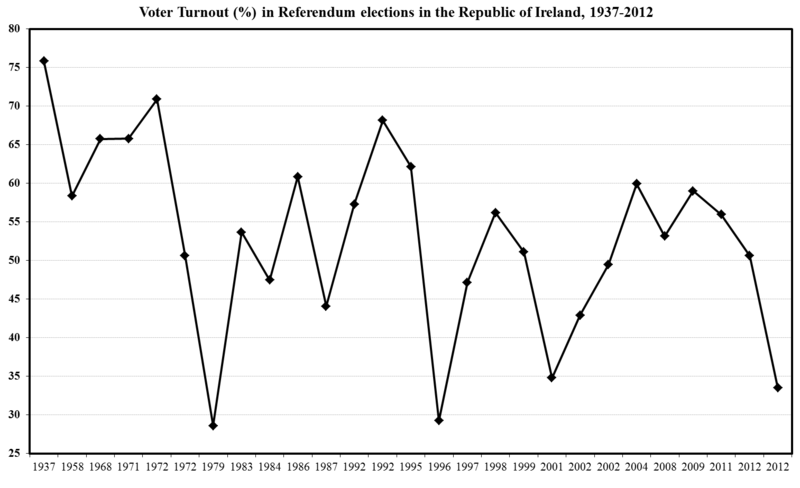 However, the spoilt vote level for the Citizenship Referendum, held on the same day as the 2004 European and local elections, was not exceptionally high (1.11%). There does not seem to be any strong evidence that holding two, or more, referendum contests on the same day can result in a very high level of spoilt votes for the contest(s) that has/have attained the lowest profile in the run up to these elections, as spoilt vote levels tend to be relatively similar for referendum contests that are held on the same day, as inferred above. The biggest difference in spoilt vote levels between contests that were held on the same day occurred in the low turnout 1979 election, in which invalid votes accounted for 3.94% of the total poll for the Seanad university seats referendum, with a somewhat lower 2.49% level being recorded for the Adoption Referendum that was held on the same day. The level of turnout can also be seen to reflect the issues involved in the contest/these contests, with high profile issues often resulting in higher turnout, as evident in the high turnout recorded for the 1971 referendum on joining the EEC. With the exception of the contests in the late 1990s and early 2000s, referendum elections on European Union issues or moral issues (divorce, right to life/choice) are usually higher than those for other contests, especially those in which the issues appear to be relatively non-contentious, as with the adoption rights/university representation in the Seanad contests in 1979 and the 1996 bail referendum, which are associated with the two lowest turnouts for referendum contests to date in the history of the state. The day of the week that an election is held on is believed to impact on turnout levels, with the general consensus being that weekend voting is the best in terms of facilitating a higher turnout level. Ironically the 2012 Children’s Referendum was only be the second time a referendum election has been held on a Saturday and this was marked by a very disappointing polling level, as shown by Figure 1, but it could argued that turnout levels would have been even lower for that contest had the election been held on a weekday instead. The only other occasion that a referendum contest has been held on a Saturday was the second referendum on the Nice Treaty, held in October 2002, in which the holding of the election on a weekend is believed to have played a role in increasing the turnout level by 448,703 votes (and by 14.68% in percentage terms) relative to the first Nice Treaty referendum, which had been held on a Thursday, almost a year and half beforehand. Thursday has proven to be the most popular day on which to hold a referendum election (or a series of referendum elections), with Thursday being used as a polling day on 13 occasions to day (48.1% of all cases, if the October 4th contests are also factored in). Wednesday and Friday are the next most popular days to hold polling on, with these days each having been used on five different occasions prior to the Seanad Abolition/Court of Appeals referendum votes. The October 4th poll however will mark the sixth time that that a referendum contest, or number of referendum contests, has taken place on a Friday. Wednesday proved to be a more popular day for polling in the case of the earlier referendum contests while Friday was only used as a polling day for a referendum contest for the first time in 1995 (Divorce referendum). The contests held on a Friday (1995, 1998, 1999, 2004, 2009) and Saturday (second referendum vote in 2002) – the 2012 Children’s Referendum marking a notable exception here – have tended to compare favourably in terms of turnout levels with those for other referendums held in a similar period (1990s and 2000s). It could be argued that Friday/Saturday contests tend to be chosen in cases where government believes a high turnout to be necessary for the passing of a referendum. There has never been a referendum election on a Monday or a Sunday to date, while polling has taken place on a Tuesday on just one occasion (1987) to date. One final point to note is that geographical studies of turnout patterns point to fairly consistent trends running across different referendum contests. As opposed to the trend for local and general elections in which the highest turnout levels tend to be recorded in the more rural areas, the lowest turnouts in referendum elections tend to be found in the more western constituencies (with turnout levels usually lowest in Donegal) and average turnouts for urban areas can be as high, or higher, than the average for rural areas (as shown by Figure 2). Referendum turnout levels tend to be highest in the more middle class urban constituencies, with the highest levels usually being recorded in the constituencies of Dun Laoghaire, Dublin North-Central (which will form part of the new Dublin Bay North constituency following the next general election) and Dublin South (whose boundaries are being significantly amended and which is being renamed as Dublin Rathdown). Looking at a sub-constituency level, it can be seen that class trends for referendum contests tend however to reflect those for other electoral contests, although class differentials in turnout rates tend to be heightened for referendum contests, relative to those for general and especially local election contests. A more detailed discussion of referendum turnouts (in this case relating to EU treaties) in the Dublin City area has been covered in an earlier post. Indeed this and all other voter turnout related posts from this website can be accessed using the following link. Note: The official government publication on Referendum voting patterns, containing detailed (by constituency or by county/local authority area) referendum results for all contests held up to the present date, is well worth checking out. This entry was posted in Election data, Electoral Geography (voting maps), Referendum elections, Voter turnout and tagged 2012, referenda, voter turnout. Bookmark the permalink.